The Stingers women’s hockey team was eliminated from the RSEQ playoffs following back-to-back losses against their crosstown rival, the McGill Martlets. After putting up a poor effort during game one, Concordia suffered a meltdown in the third period of game two, giving up a three goal lead. After reaching the national championships the previous season, expectations were high for head coach Julie Chu’s squad. The team benefited from the return of some key veterans. Most notably, graduating goaltender Katherine Purchase, all-stars Claudia Dubois and Audrey Belzile, as well as last season’s RSEQ rookie of the year, Lidia Fillion. The veteran presence was supported by a solid youth core, lead by this year’s RSEQ rookie of the year Rosalie Bégin-Cyr. Along with her, the Stingers added 11 other recruits to this year’s roster. Growth had to be the word of the year for this young Stingers women’s hockey team. A total of twelve first year players played at least one game for the Stingers over the course of the season. Six of those rookies were on Chu’s lineup for the final game of the season. Bégin-Cyr was definitely the standout of the group, but Sandrine Lavictoire showed maturity in her first season with the Maroon and Gold. Paired with RSEQ all-star and U Sports second team all-Canadian defender Claudia Fortin, Lavictoire was tasked with first pairing minutes and will be a strong presence in the coming years. Defence was the furthest of all worries for the Stingers over the season. The combination of strong goaltending and tight defending showed the potency of Concordia’s defensive abilities. This was all the more impressive considering half of the team’s defenders were in their first season in the league. The power play was the true challenge for the team this season, especially evident in the pre-season. Back then, Chu pointed out that special units were not the focus for the team as they were still committed to putting the best team together. The hardships pursued in the season with Concordia unable to find the back of the net on the powerplay in eight different games. The bees still presented the second best power play in the league, showing some sparks of greatness playing on the player advantage. But timing is key for power plays as a special team goal can often sway the momentum of the game. This was ultimately Concordia’s downfall in the series against McGill as their power play capitalized only once on ten occasions. On the other hand, Concordia’s penalty kill was rock solid all season long, conceding only six goals on 47 opportunities to their adversaries. The team even managed to beat opposing goaltenders twice while shorthanded, the most in the RSEQ. The success on the penalty kill is in part due to the high tempo pressure established by Chu and her staff. It was easy to see nights when the Stingers were on as they wouldn’t allow opposing defenders a second to think in their defensive zone. Prowess in the crease also helped solidify the Stingers’ penalty kill. Purchase played her last game as a Stinger in the loss against McGill. She will be passing on the torch to Alice Philbert, who showed the extent of her talent in the first half the season as Purchase battled injury. Philbert earned the trust of her head coach and will be a comforting presence for Concordia next season. It was also a farewell game for veterans Sophie Gagnon, Mélinda Prévost, and Devon Thompson. 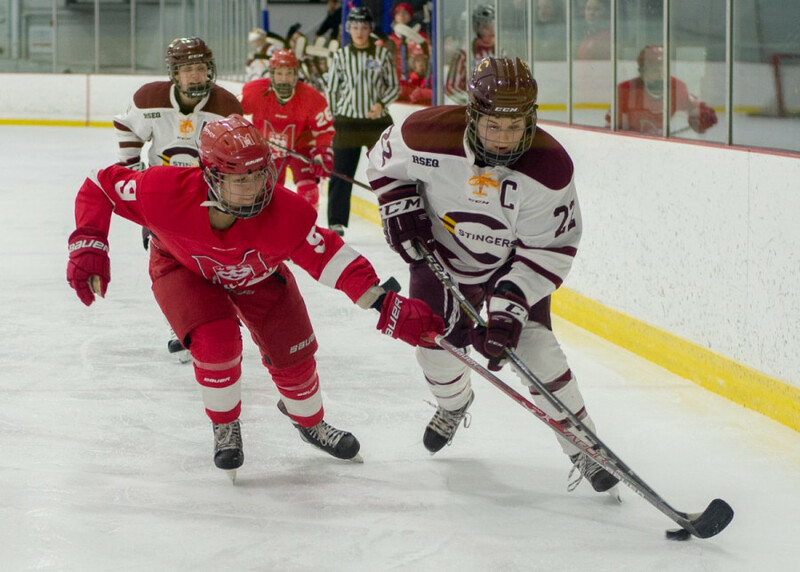 Thompson and Prévost were essential members of a heavy forechecking line for Concordia in the second half of the season, with rookie Audrey-Ann Rodrigue filling the third spot on the line. The team will have to hope that Rodrigue will be able to pass on what she learned from the veterans to future recruits. Forwards Bieke van Nes and Daniela Gendron will most likely get more ice time next season. Netherland native van Nes played in four games, mostly in the first half of the season. Gendron was in the lineup on eight occasions and even recorded her first RSEQ point in her seventh game. With the departure of Thompson and Gagnon, the Stingers will also have to fill both the captain and an assistant captain role. Assistant captains Audrey Belzile and Claudia Dubois will be early favorites for the titles. They are long time leaders for the squads and will once again be looked up to. The Stingers have already announced the commitment of three new players to next year’s lineup. Headlining the crop is forward Emmy Fecteau out of the powerhouse Limoilou Titans. Fecteau finished the season with 46 points in 24 games, good for third in the league behind teammates Maude Pépin and Clarkson University commit Gabrielle David. The program will also welcome Ontario’s Scout Watkins-Southward. The forward played for the Kingston Junior Ice Wolves of the Provincial Women’s Hockey League for the past three years. She captained her squad this past season, putting up 32 points in 35 games. A new sibling connection will be created with the arrival of forward Léonie Philbert out of Dawson College. Léonie is the younger sister of Stingers goaltender Alice Philbert, and the forward put up 21 points in 24 games in her final cegep season. Following this year of growth, Concordia should be set for a stronger season in 2019-2020 provided the large crop of rookies from this past season step up to fill in the shoes of the graduating veterans.